After a month of leafing through summary reports and skimming predictions for next year, I was tired of reading and even more weary of the idea of starting a new book that might require some effort to enjoy. So it was with relief when I came across this book and remembered I'd been meaning to read Martinez for some time now. This book was just what I was looking for: a weird quick and easy read. Because that's what it, and I suspect all of Martinez's writing, is--an amusing break, from boring repetitive routines, that doesn't require much brainpower to enjoy. The writing is light, fast paced, and doesn't take itself or anything else seriously. It's funny at times and somewhat poignant at other times when you least expect it. The humor is not what I'd call sharp or hilarious, but it's absurd enough to carry the story through to the end and unusual enough to hold my attention. My attention span wanes easily around this time of year, so it takes some effort for me to concentrate. I tend to abandon slow-moving books while in this mood, and yet I was able to just breeze through this story with minimal effort. Characters: So a vampire and a werewolf walk into a diner and find themselves in the middle of an impending apocalypse... that's the joke. The punchline is this kind of thing happens all the time. Gil's Diner is the unfortunate focus of the apocalypse. The rest of the story takes off from there like a ditzy adolescent Satanist-in-training bent on opening a portal to hell. Characterization: Each character is defined by the crazy and absurd things they do and say more than their supernatural species or physical descriptions. They're also defined by the crazy and absurd things that happen to them. Almost every character is an otherworldly creature, and yet they're very much like the crazy people you might run into every day on the street. And this is just the opening chapters. Tone: A lot of fun. So much fun, in fact, that I'd originally mistaken this story as a tale for middle-grade readers, but the amount of gore and bloodshed that followed the first chapter made me reconsider. Humor: Subtle, yet effective. 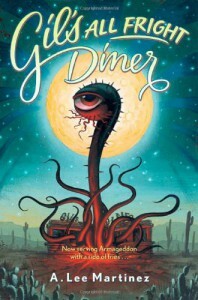 It doesn't draw attention to itself or to all the weird things that keep happening in and around Gil's Diner. Instead, the focus of the story is on finding the culprit of the weirdness and putting an end to whatever that happen to be. The highlight of Martinez's writing is in his ability to keep the narration as close to being unintentionally funny as possible, while letting the characters, supernatural elements, and other absurdities carry the story. Kopp went to the cooler and grabbed a soda. "Figured it was sumthin' like that." "Oh, I've had plenty of experience with this sort of thing. 'Bout seven years back, had an outbreak of vampire turkeys. And four years before that, Charlie Vaughn's daughter got herself possessed. And the Stillman's scarecrow took to wandering around at night and scaring the bejeezus outta the kids. Point is, Rockwood has itself an unusual history, and being sheriff means dealing with those problems." Kopp flipped through the purse. "Ah hell. Not another cult." "Yeah. Seems like one pops up every couple of years. It's gotta be the heat." "You need a movie theater," Duke observed. "I've been trying to get a public swimmin' pool." You don't go into a book like this expecting it to make sense or for it to provide interesting commentary or even play by its own rules. What you can expect is for a good time and a few laughs to be had and maybe for events in the story to tie up with some satisfaction at the end, which they do. This book was exactly what I needed this past weekend. I read it on and off, in between visits to and from family and friends, and I even read it while on the road, and not once did I lose interest in the story's absurdness. It was a nice break from "serious" reading and too much family time. It didn't occur to me at the time, but now that I think about it, Martinez's writing style and sense of humor are similar to Christopher Moore, albeit Martinez's is more mouthy, profane, low-brow than Moore's. Still entertaining though. Martinez also reminds me somewhat of Douglas Adams. Fans of the Hitchhiker's Guide would definitely take a liking to Gil's Diner.